Hospitality, comfort and location all perfect! Positive experience from start to finish. 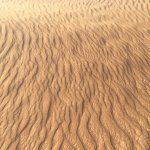 Great, quiet location in an otherwise busy place. Facilities and staff were excellent. Thank you to Yani, Gede and the wonderful staff at the villa Kalimaya 3. We were incredibly grateful to be looked after by the helpful staff at Kalimaya Villa 3 for our holiday to also celebrate our friend's wedding nearby. Nothing was too difficult for the entire team and every request was meant with a smile and efficient service. Delicious breakfast was available every day we required it, as well as great recommendations. 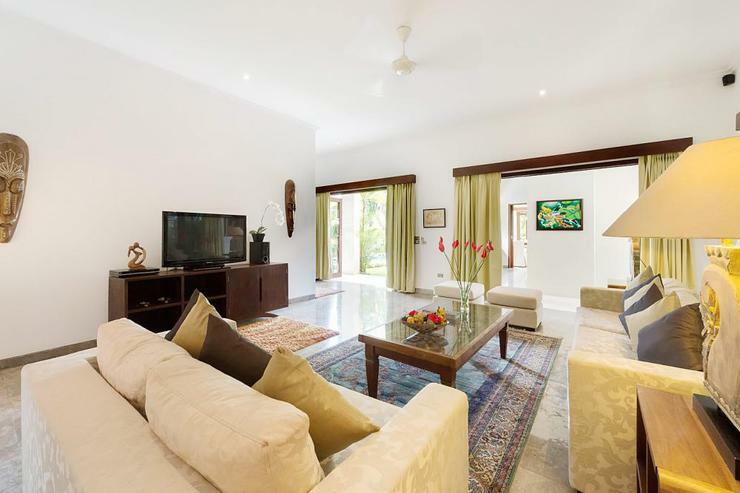 The Villa itself was beyond our expectations and housed two couples very comfortably. We would like to sincerely thank everyone at Kalimaya who made this Bali holiday such a memorable time for us. Cannot rate this Villa highly enough. Stayed at Villa Kallimaya 111 for 1 week.probably the best holiday stay I have experienced.Greeted by all staff and presented with wet face cloths and a sarong on arrival. Villa absolutely immaculate. All facilities amazing.sauna, jaqcuzzi, pool, air con in all indoor areas. Fridge well stocked. Staff extremely helpful, would cook anything you wanted,wheneveryoubwanted it. 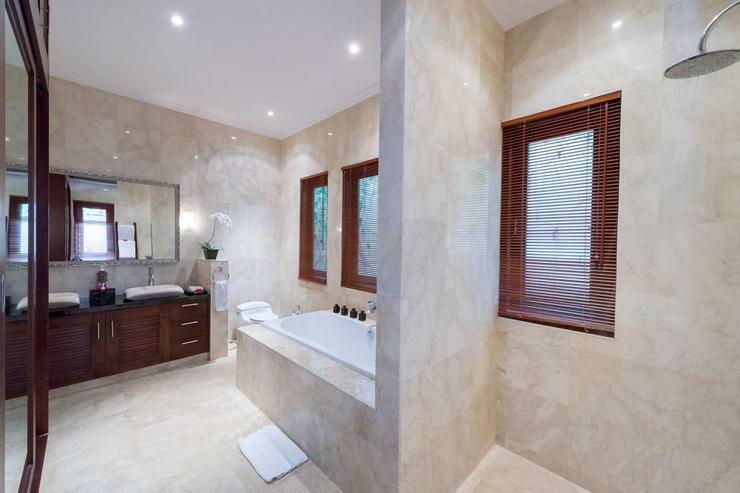 Bedrooms and bathrooms well equipped. 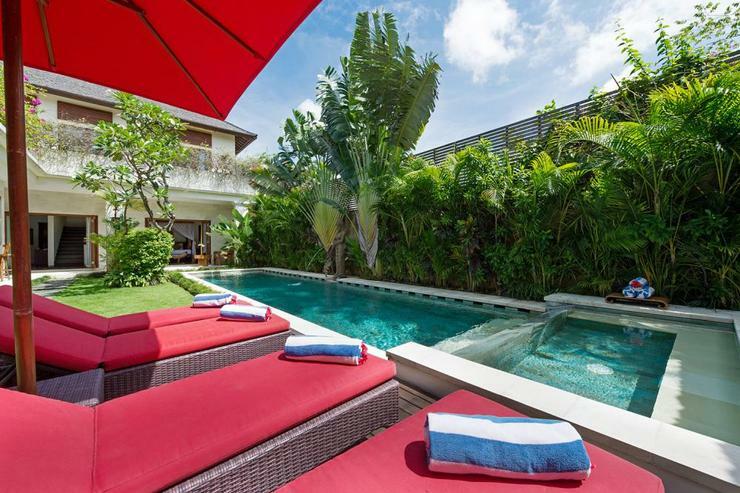 Villa is a short walk to the beach in one direction or the shops and eating areas in the othr. Beautiful new shopping mall next door with a fabulous beauty spa on the top floor. Very reasonably priced. The manageress Fysh came to the villa each morning over breakfast,when we could order anything ie. Book a spa treatment, book a car for the day, or just what we wanted for breakfast the day after. She was extremely helpful and always pleasant and friendly. Definately enhanced the whole holiday with her friendly and efficient manner and all her local knowledge. 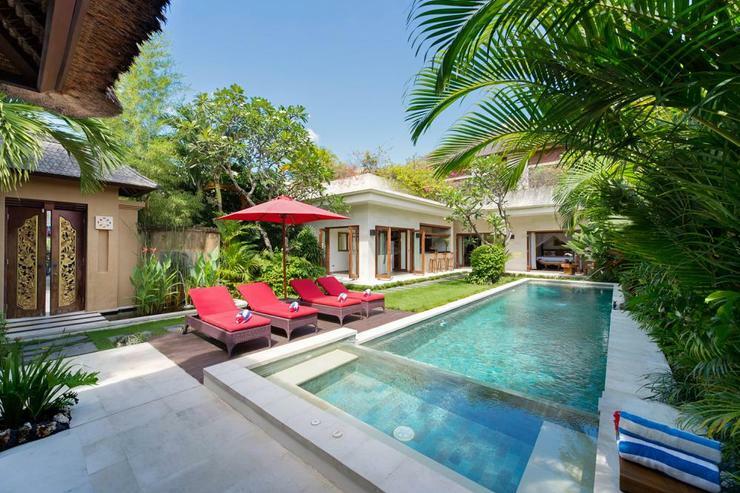 The villa itself is located right next door to the Seminyak Village shopping mall. 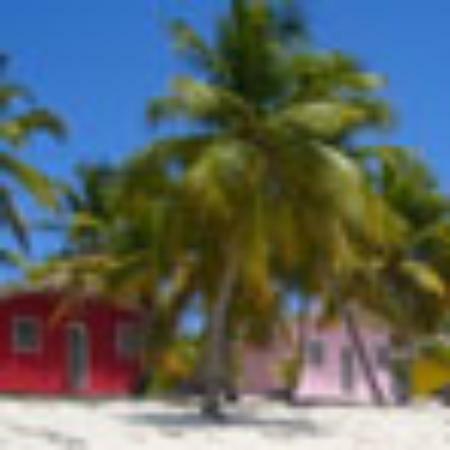 Very central and easy walking distance to all the lovely restaurants and many beach bars. 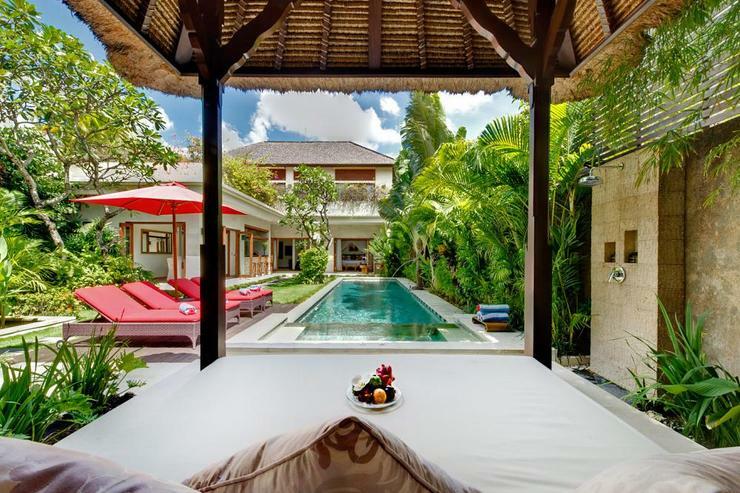 Such a comfortable retreat, huge pool and outdoor area. 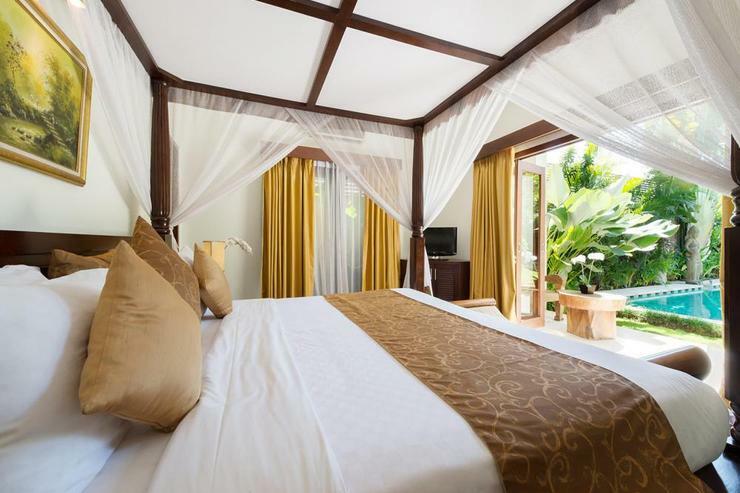 Bedrooms are enormous, beds are so comfy and the whole villa is spotlessly clean. We were treated so well with a turn down service every night and a quick spray to ensure no mozzies had managed to sneak inside. The fridge was well stocked on our arrival and nothing was too much trouble during our stay. The team were always on hand to help us and went above and beyond. There is security outside the villa entrance 24/7 and everyone was so friendly and helpful. The on site chef cooked us a couple of delicious meals and Uli cooked us lovely breakfasts each morning. 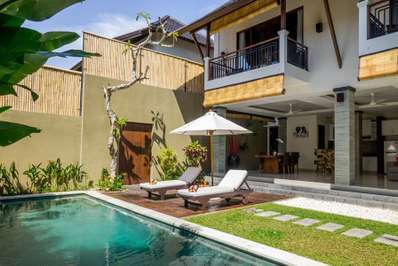 Would thoroughly recommend Kalimaya III to anyone considering a couples or family trip to Bali. 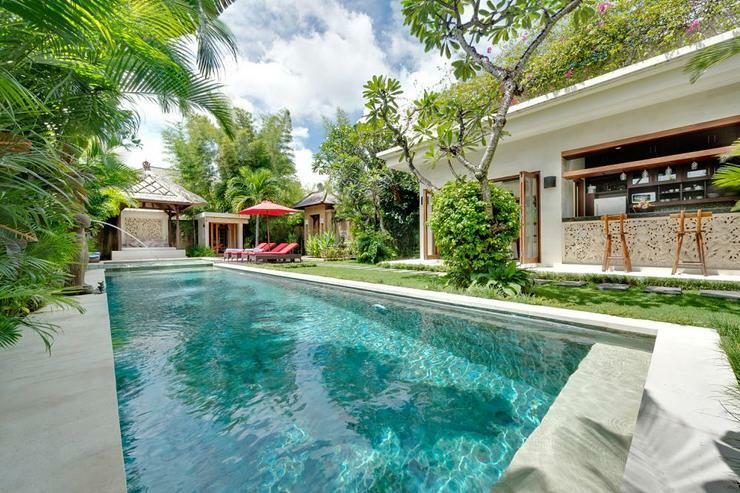 Named after a fabled river of gems, the Kalimaya villas consist of a selection of two, three and five plus one bedroom residences located within the pulsing heart of stylish Seminyak, just a breath away from some of the best restaurant, bars and shopping and only a minutes walk to world famous Bali beaches. The villas are looked after by dedicated, professional and knowledgeable staff who will ensure that your stay at the residences exceeds all expectations. 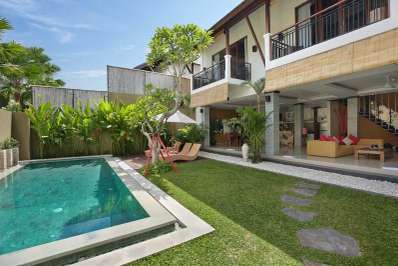 A short stroll down a quiet gang (laneway) from the main residence takes you to Villa Kalimaya III. 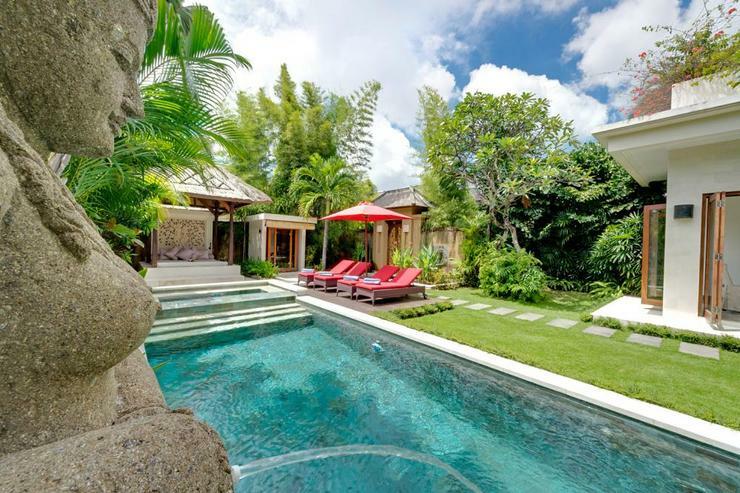 Villa Kalimaya III is a three-bedroom, two-story villa featuring air-conditioned, king size bedrooms with marble ensuites, two indoor living areas, open-plan kitchen, dining room, terrazzo and a private swimming pool with spa. 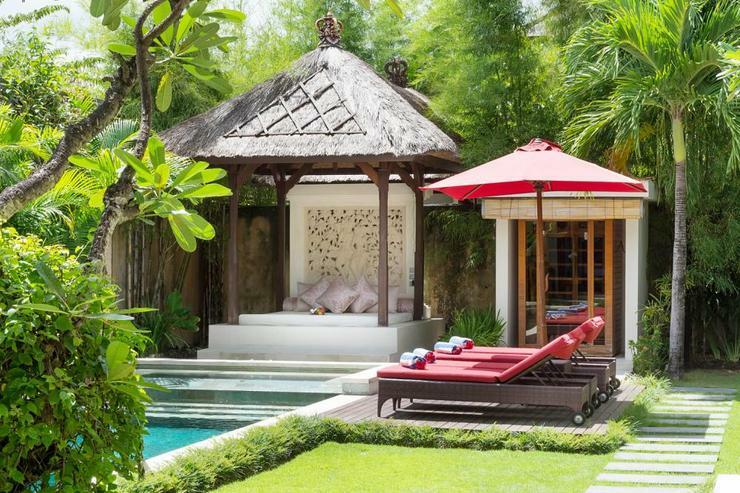 The villa is set within lush tropical gardens that feature traditional thatched bales. It is arranged around an aqua blue sparkling swimming pool. 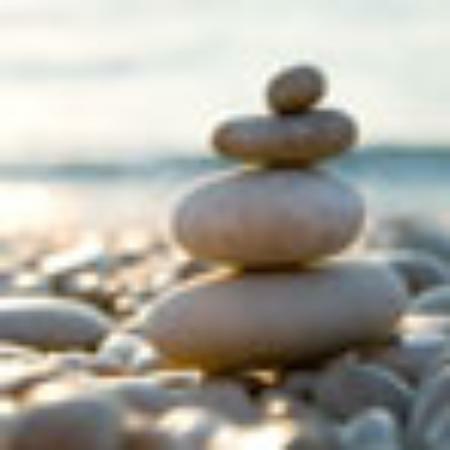 For the health conscious, there is an infrared sauna, ideal for rejuvenating and improving your wellbeing. 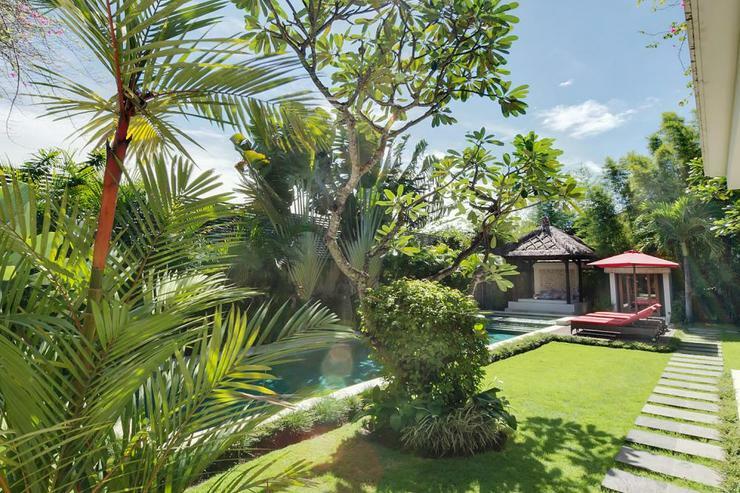 The ground floor contains the open plan kitchen and dining room, lounge room and one of the spacious master bedrooms with glass doors that open onto the garden and pool area. The second bedroom upstairs opens onto a terrace as well as an upstairs lounge and entertainment room. 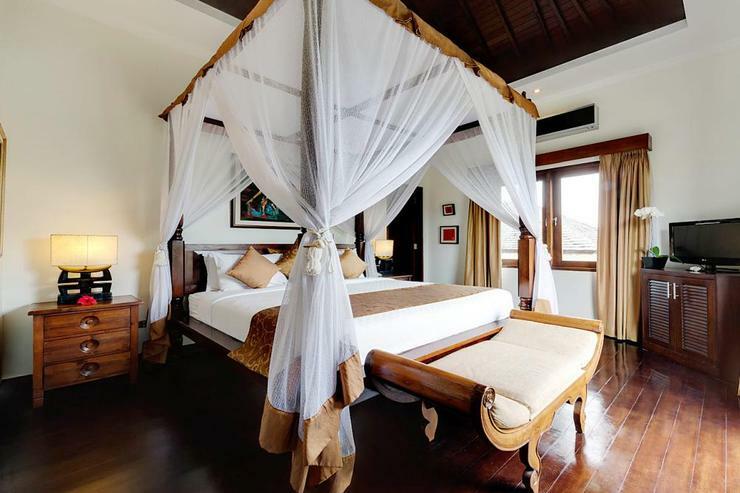 Villa Kalimaya III has three beautiful air conditioned bedrooms fitted with spacious four-poster beds. 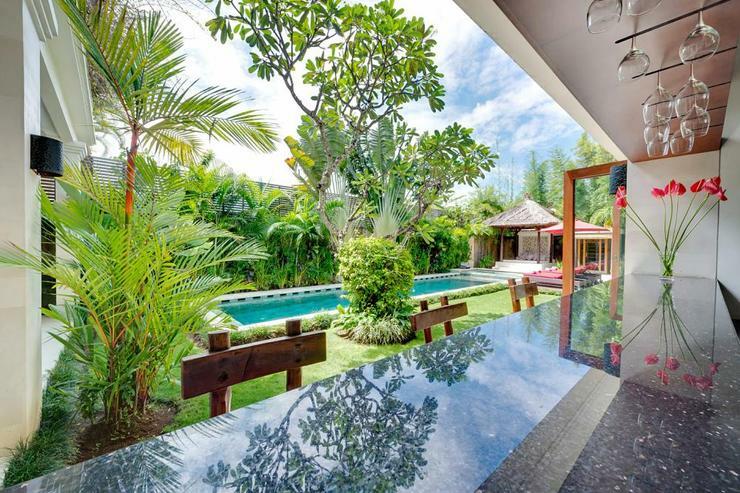 The downstairs rooms have full-length glass doors that can be opened up to view the tropical garden and pool area, whilst the upstairs rooms open out onto the terrace. 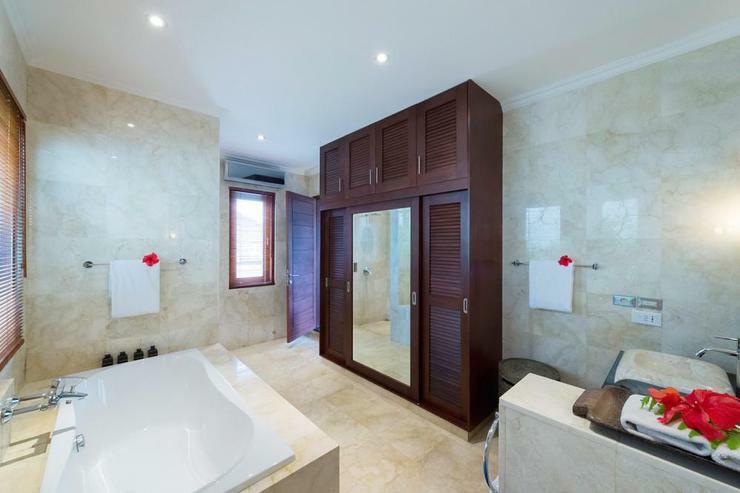 All bedrooms have ensuites featuring large bathtubs and rain showers, and are fitted with a TV and DVD player. 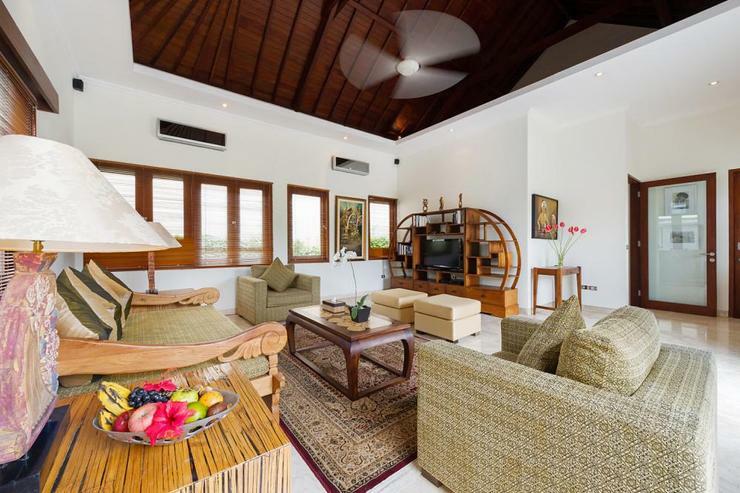 The villa has three indoor living areas including two living rooms - one up and one down - which can be opened to allow in the warm tropical breezes or closed for absolute air-conditioned comfort. Both rooms are equipped with satellite television and DVD player. 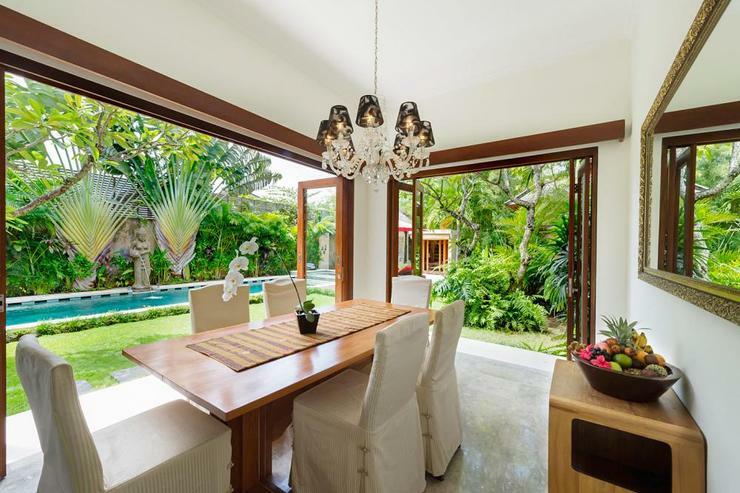 The dining room, which directly overlooks the garden and pool, can be opened to give a sense of indoor/outdoor living or closed for comfortable, temperature controlled dining.